When many people chose to stay back at home last weekend, some of my students had followed me for “dragon spot searching” workshop. We ventured into one mountain to another mountains. Most of the time we were in hilly areas or mountainous areas. At the end of the workshop, 2 students have experienced dragonic enhancement which shown clearly and obviously in their face (it sounds irrational but the persons who experience this know very well). The face becomes brighter and shining during the workshop. Moreover, this is very common scenario for masters who practice dragon spot searching……. 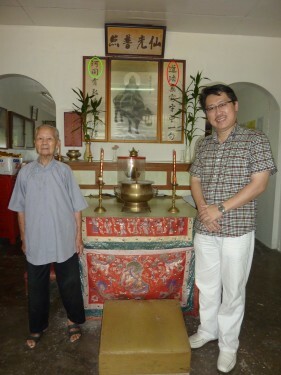 I have led them to a private-owned Dao Temple which is not open for public. It is located in a very rural and hilly site. It is purposedly built to be hidden from the public in order to acheive peaceful environment for Daoistic meditation. This is specifically meant for Daoism meditation in term of longevity. It is NOT a normal Chinese temple because it is associated with many mysterious elements and one of the element is about dragonic embrace with High Energy……One day, if you could reach this place, it means you are divinely selected few. …. Daoism ( refers to real Taoist who knows the powerful Chinese Kundalili, meditation) always associates with dragon spot for Energy Enhancement. Daoism knows the secrets of Yijing易经, He Tu 河图 , Luoshu 洛书 and bagua八卦. By knowing the real secrets of Yijing and Dao, they are able to cultivate the inner qi and energy for health and longevity… In this world, that is only one religion promise long life or longevity….. Real Daoism….. While a feng shui practitioner limits himself by luoshu and bagua for Qi estimation and culculation, a Real Daoist is able to “change” one’s physical condition to acheive health and longevity at the one hand, and get dragonic spot enhancement on the other hand. Metaphysic is more than feng shui. Dragon spot is the TOP Secret of feng shui. However, only divinely selected persons will be benefitted from dragon spot…. Below I attached an explanation how Taoist makes use of He Tu 河图 inner energy cultivation. Knowing the secret of He Tu, you will never be so scary of Five Yellow 五黄 in flying star system( one of feng shui school of thoughts)…. On the contrary, you might be able to know why and how I make use of Five Yellow 五黄…….